If you grew up watching the Terminator series, you are very likely to fear that the human kind will be wiped out by robots in the future. Devid VII probably wants to disturb us deeply so he made a small scene depicting the birth of an intelligent robot and this exact moment will be the end of us! Devid cared to write a brief background story for his creation in which he names this dreadful robot as General DR-ONE who shall command rest of the drones in the universe. This robot design was utilized in a prior work of Devid along with another rebel robot delivering weaponry to take over humans so shame on them! 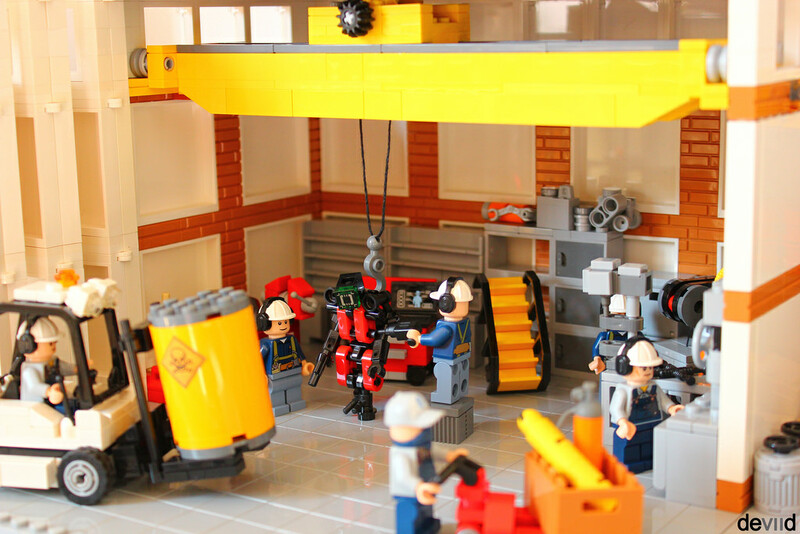 The workshop may look simple at the first sight but it includes a seemingly functional crane system, folding warehouse doors, a forklift, shelves, various machinery and a nice orange ladder along with some very busy people. If you pay attention to details, you will find many inspiring elements so go ahead and take a closer look!